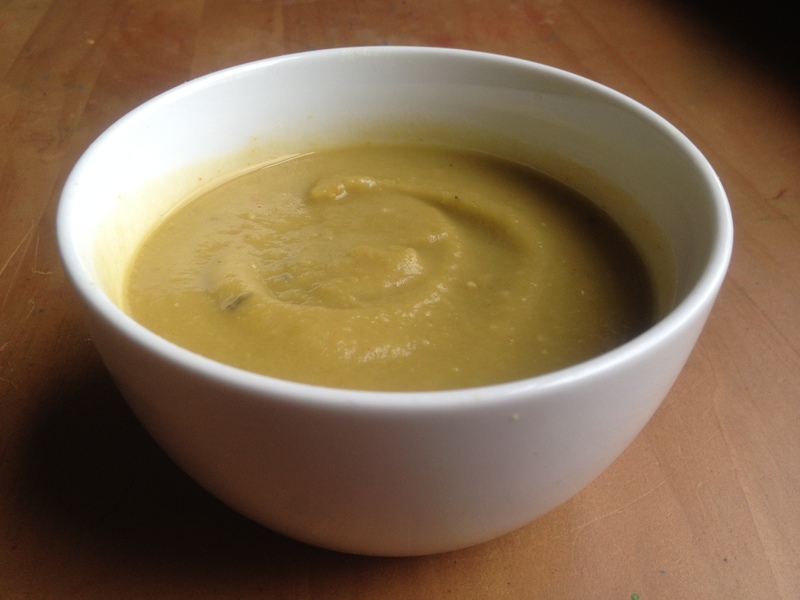 I make lentil and bean soups often but, strangely, I don’t think I had ever made split pea soup before this week. You know why? Because the recipes always call for an “optional” ham hock. Whatever that is. And I can never believe that recipes calling for “optional” meat are going to be any good if you leave the meat out. I automatically skip over any recipe that calls for bacon and then implies that the vegetarian version will be just as good if you simply omit the bacon. The bacon is the FLAVOR in that recipe, and a good vegetarian recipe builds flavors in a different way, through spices and cooking technique. But when I made that Smoky Cauliflower Frittata recently and J said it tasted meaty, I had the obviously-delayed epiphany that the flavors that bacon and ham hocks add are smoke and salt. I was ready to make split pea soup. I went right to the source for my recipe: Pea Soup Andersen’s Facebook page. This recipe is vegetarian in the original, but just to be on the safe side–in case those ham hock recipes are on to something–I replaced the cayenne with hot smoked paprika anyway. To make a regular-big (not truly huge) pot of Vegetarian Split Pea Soup, dice a large onion, a large carrot and a celery stalk and saute in olive oil until the vegetables soften and the onion is translucent. Add 1/4 tsp. dried thyme and 1/2 tsp. smoked paprika and stir, then add 2 c. sorted and rinsed green split peas, 8 c. water, a bay leaf and 1 1/2 tsp. salt. Maintain a peppy boil for 20 mins, then reduce heat and simmer until the split peas are very soft, probably about an hour in all, stirring occasionally. Season with salt and pepper. 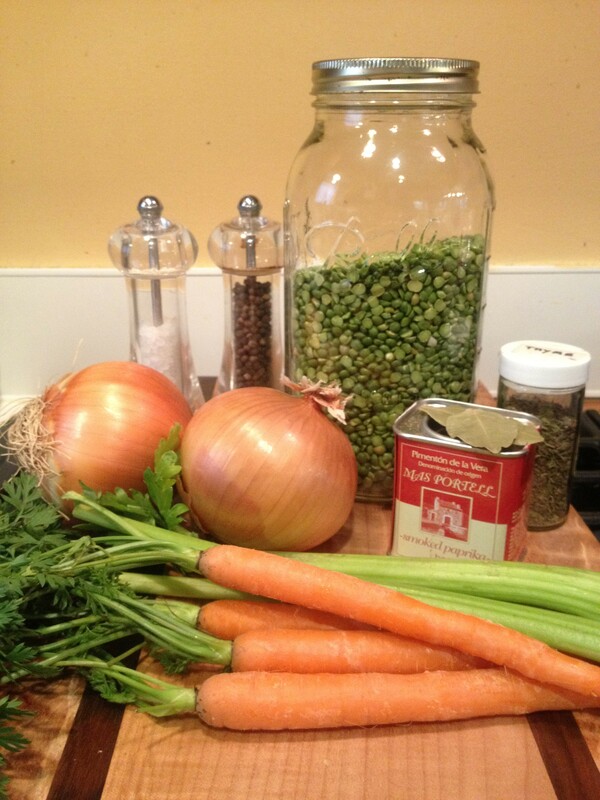 I originally planned to puree the soup, but once I cooked the peas down to mush I loved that texture too. It tastes great both ways, but I think the pureed version looks a little more elegant. If you want to get fancy, you could top the soup with another sprinkle of smoked paprika or some homemade croutons. Or serve it with a nice easy bread or homemade rye crackers. Or just keep it in the fridge to reheat (thinned with a little water) for lunch this week. This entry was posted in Beans and Other Legumes, Easily Multiplies to Feed a Crowd, Soups, Vegan or Would-Be-Just-As-Good-Vegan and tagged cooking, dinner, food, lifestyle, recipes, soup, vegetarian on February 15, 2012 by emmycooks. I’ve been looking for a meat free version that’s not short on flavor! Thank you! I usually have ham in mine.. but you’ve opened the door to other alternatives for those days when I don’t have slices of ham left-over in my fridge and I’m craving split-pea soup!! Yum! That looks and sounds incredibly good. Thank you for this recipe. AWESOME ! I’m a big fan of split red lentils but THIS is what I was looking for on the split pea front. Thank you! I have my own recipe for lentil soup. Would you let me know if you get a chance to try it? I love the look of that recipe because it’s very much like one that an Indian friend of mine wrote down for me in college that I love and I have kept it in my recipe box ever since. You know how nice it is to see an old friend’s handwriting? I will remember to try your variation next time I have that soup in mind! Nice, I like the economy of a pot cooking and a house warming at the same time. So cozy! I think the use of smoked paprika is brilliant. What a great way to break down the recipe and rebuild it without the pork products! Go you! It still looks wonderful despite the lack of pork! Thanks for this recipe! I made it today, and it was perfect for the cold, rainy weather. I’d originally planned to puree it, but I decided not to because I somehow managed to get my food processor bowl hopelessly wedged into an impossible position prefer the more rustic consistency. See, that would have come across as funny if I’d successfully managed to cross out the part about the food processor. Apparently technology in general hates me today. No, no, think of it as technology GIVING you a comfortingly chunky (why does that sound bad when it’s so good?) soup. I quite liked the unblended version as well. And also, when technology hates me, I like to take it as a sign that I should retreat to a simpler place and time, like maybe inside a spa. p.s. I’m glad you liked the soup.